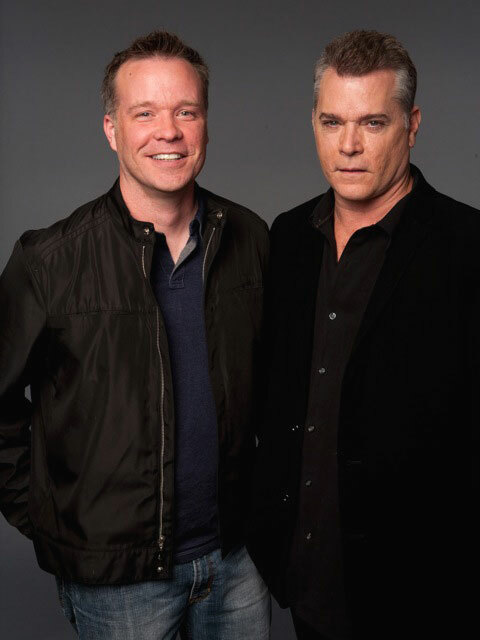 Director Robert Kirbyson with actor Ray Liotta. Image by Leslie Hassler. How does being the best storyteller at a childhood sleep-over lead to cinematic gold? Snowmen, writer and director Robert Kirbyson's first feature film, is based on Kirbyson's actual childhood in Winnipeg, Canada. Kirbyson has a kind of "Jimmy Stewart" quality. Within two minutes of his sitting down, you are utterly on his side without even knowing quite what has happened to you. He looks for the best in people, and finds it. The real life circumstances behind Snowmen were somewhat tragic. There was the loss of Kirbyson's father to Leukemia at age 13 and the death of Howard, the young son of their Jamaican friends who lived across the street. However, Kirbyson wanted to make an inspirational film, reflecting the togetherness and beauty that he found in people and in the town following these losses. Kirbyson wanted to show "the innate ability of children to find joy in all circumstances". 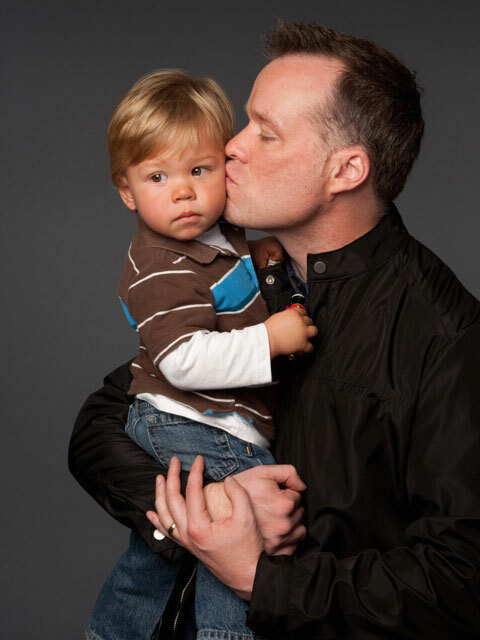 Kirbyson showed up at the studio to be interviewed and photographed carrying his very beautiful and extremely sleepy son Brandon. He talks about the inspiration behind Snowmen, what getting this particular cast has meant to him, and how stories can transform us, either at a birthday party, or on the big screen. Does parenting make directing easier? So maybe, in fact, your career prepared you for parenting? Kirbyson: I think so. I've been a dad for the past twenty years, I just didn't have a kid yet. (laughs) Not only controlling hysterical child actors, but adult divas? Kirbyson: Finding out what the actors want to do, and then helping them get there. Is it true that this film came about as the result of an incredible snow-filled childhood in Winnipeg? That you wanted to capture snow in a way that hadn't been on film yet? There are a lot of winter type movies that I felt had moments of accuracy, but then I would think, "No, no! That's not what the inside of a snow fort looks like!" What does the inside of a snow fort look like? Kirbyson: It's actually quite dark, unless you've got tunnels coming into the center. The snowplow incident in the movie really happened to me as a kid. Where we were building a snow fort and we got run over by the snow-plow, who was piling up all of the snow from the street. We're fortunate that you lived to make your own movie! Kirbyson: What's funny is that when you're a kid, you do not think of that as life threatening. It just makes a great story to tell at school the next day. "I can't wait to tell my friends!" You don't think all the way through. Everything in the movie has happened to me, or to someone I know. At the same time, it didn't happen exactly that way. When you're a kid, things seem so much bigger. One of the goals of this film was to show the events as they seemed to me as a kid. Which is probably bigger than it actually was to any of the adults there as a kid. We never did set a world record. But we tried. Unofficially. What an incredible cast you've gotten! Ray Liotta, Christopher Lloyd....and wonderful child actors. What was the casting process like? Kirbyson: For the child actors, we had narrowed down our top picks, but when they came in, even though they were doing a good job, they didn't feel right. And there came a moment when we all looked at each other and thought, "We might not make this movie." Bobby Coleman came in last. And he came in just so excited about this sculpture he had seen in the living room, he actually dragged one of us out to go look at it. He comes back in, is totally in character, completely emotional, and does this amazing scene and goes back out of the room. I turn around, and I look at John and Steve and Andrew and we say, "We're makin' a movie!!" Bobby was the character. This over-exuberant story-teller. Robert Kirbyson and his son, Brandon. Image by Leslie Hassler. What was it like to have Ray Liotta play a character who is based on your Dad? Kirbyson: What's funny is that when they asked me who I wanted to cast, we initially thought of comedians. The character has to do these crazy car commercials, so we thought maybe we were looking for a funny-man who wanted to show a serious side. There are so extremely emotional moments for the father, and we needed to find someone who could do that. John Shepherd (producer) knew Ray's agent and asked what I thought. My first real reaction was, "You think he'd do it?! Don't get me excited!" Do not even bring this up to me if it is not a very real possibility?! Kirbyson: Exactly! Then another member of casting said, "Ray Liotta? Maybe if the kid ends up in the trunk!" But he has a broad body of work. Many people have extremely tender feelings about him as the father figure in Corrina Corrina. In terms of comedy, I saw him play a cameo as himself on the television show Just Shoot Me. He had a recurring role, and even though it wasn't normally a show I watched, I kept tuning in to see him because he was so funny. "He is Funny!" I said. He has so many different kinds of emotional moments in this film. When he does the car commercials in the film, you can see that beneath that comedy is the desperation of a father who needs to sell cars for his kid. That's what Liotta brings that most people couldn't even touch. Those layers. His comedy is something almost tragic. I think it's quite beautiful. So much of our best comedy comes from pain, doesn't it? Kirbyson: That's his way of hiding it almost. Liotta is the whole package. And he has a daughter who is the same age as the kids in the movie. Karsen was eleven then. We have an amazing shot of Karsen throwing a snowball. Seriously, she had the strongest arm on the set! How did you come to filmmaking? Kirbyson: I terrify myself when I wonder what I would have done if I had come into being before film-making existed, because I feel like I am genetically predisposed to be a film-maker. I have always been the story-teller. I remember always being invited to birthday parties to tell stories, and sometimes I didn't even know whose birthday it was! I was the kid who told stories. I made my first movie when I was seven starring my best friend whose family was from Jamaica who lived across the street, whom this movie was based on. What was the film industry like in Winnipeg? Kirbyson: There wasn't really one. I remember panicking when I was going to have to decide what my career would be. I was going to go into the Sciences. But my mother, I remember her laughing. She said, "You're creative. You're going to do something creative. You're going to make movies." I don't know how many mothers would say, "You don't wanna become a doctor! That's ridiculous." I grew up in a community of people who, even when it seemed to me like I couldn't do it, said, "You're going to win an Academy Award one day." But that's not my goal. Kirbyson: My goal is to sit in the theater, and watch my movie when nobody knows I'm there. Not a special screening, just an average screening some weekend when people have come. They watch the movie, they get excited, you can feel their participation in the experience and at the end they spontaneously applaud because they have enjoyed it. To me, that's success. Having told a story that moves people in some way. That's all I want.